This pattern comes with lots of photos, thus making it perfect for those still learning to crochet and read patterns. As for the bunting, it’s perfect for all your celebrations from summer holidays to graduations and birthdays! The pattern calls for a worsted weight cotton yarn and a 4.5mm crochet hook. 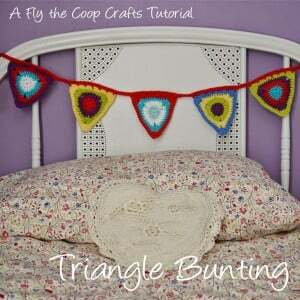 If you enjoyed this free crochet pattern you might also enjoy more designs by Fly the Coop Crafts.